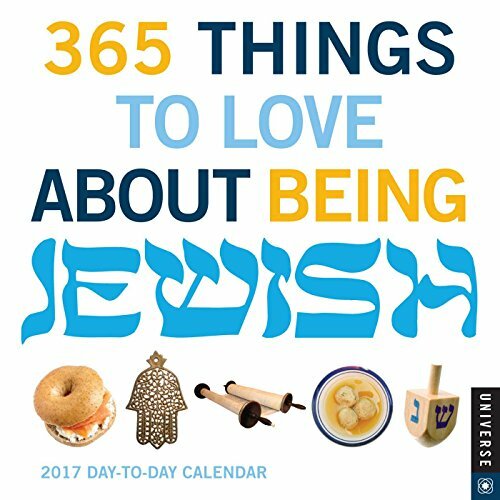 365 Things to Love About Being Jewish 2017 Day-to-Day Calendar serves up, along with a big bowl of chicken soup, a daily reason to celebrate being a member of the tribe! Each day provides a healthy schmear of Yiddish words and phrases, religious and secular traditions and celebrations, timeless Borscht Belt jokes, trivia about famous Jewish celebrities, and, because you look too thin, mouthwatering entries devoted to enough food to make any Jewish mother proud, including pastrami, matzo, hamantaschen, and chopped liver. From alta cockers to boychiks, this day-to-day calendar will have everyone kibitzing throughout the year. The only daily calendar that speaks to the total Jewish experience, it includes a curated selection of secular and religious trivia, family-friendly humor, and Yiddish phrases.